Salt Mist Chamber for Oil, Petroleum & Paint Testing - Salt Fog Testing and Corrosion Testing in Salt laden atmosphere. Unit is supplied with SS rods and hooks for hanging samples Designed to deliver compressed air at a pressure upto 1 kg/cm2. Suitable for operation for 220 V, 50Hz, single phase, AC supply. Temp. Range : From Room temp; to +55oC Humidity Range : Upto Saturation Limit Control of Temp. : Digital Readout of set and actual values Testing Chamber : Acrylic Glass of 8 mm thick, Nozzle made of Acrylic platic Heating : SS Heating Element, 0.75kW, 220V, single phase AC, fitted in the salt solution tank Solution Tank : Made of Fibre Glass, Double walled, capacity 35 litres approx, with provision of water level Chamber Stand : Made of MS Angle Various Models of Salt Mist Chambers offered/ (Without Compressor) -: 45 x 45 x 45 cm (size) -: 45 x 45 x 60 cm (size) -: 40 x 50 x 75 cm (size) -: 40 x 50 x 90 cm (size) -: 45 x 60 x 90 cm (size) -: 60 x 60 x 60 cm (size) -: 60 x 60 x 90 cm (size) -: 45 x 60 x 60 cm (size) -: 60 x 60 x 100 cm (size) -: 90 x 60 x 90 cm (size) Note : Salt Mist Chamber with inbuilt compressor can also be supplied on request..
We are leading manufacturers, suppliers & exporters of Salt Mist Chamber For Testing Lab for Oil, Petroleum & Paint Testing Lab. 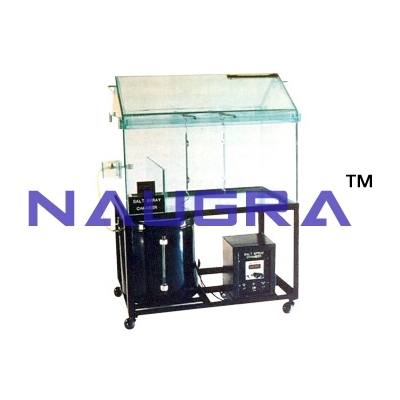 Contact us to get high quality designed Salt Mist Chamber For Testing Lab for Oil, Petroleum & Paint Testing Lab for schools, colleges, universities, research labs, laboratories and various industries. We accept bulk orders for government tenders in all countries around the globe.